In Touch Physical Therapy has been providing physical therapy and wellness services in Owatonna, MN since opening in 1996 by Dr. Anne Lamb, DPT, MSHCA. At In Touch Physical Therapy, our mission is to help each patient reach their full potential in every aspect of their life. We strive to address all patient’s injuries and disabilities holistically in a comfortable atmosphere. Our experienced staff is dedicated to providing quality treatments, utilizing hands-on manual skills as our primary tool to effectively meet our patients’ physical therapy needs. Think where you could be in 30 days. Reduced pain, happier, healthier & stronger! In Touch Physical Therapy owns the only AlterG® in Southern Minnesota open to the public. 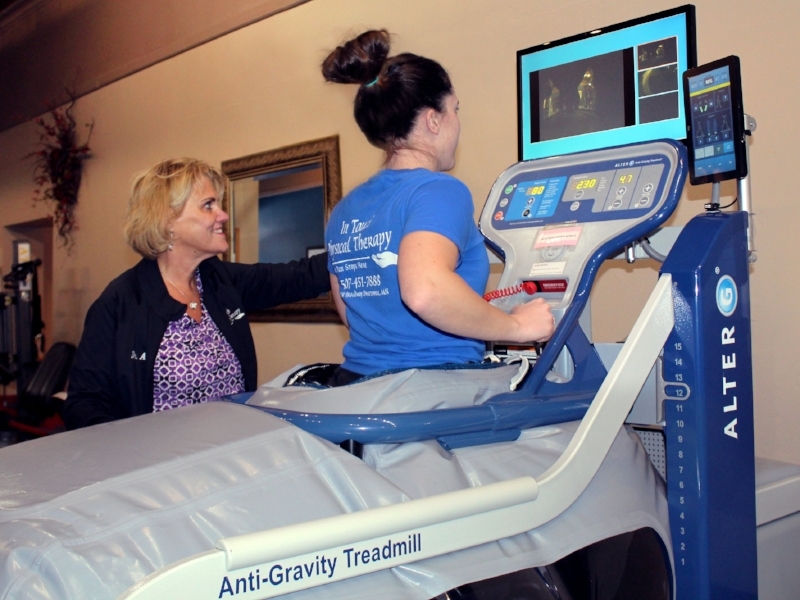 The AlterG® is an Anti-Gravity Treadmill an unloading, weighted effect so you can return to walking or running faster post-surgery or post-major injury. What is Pelvic Floor Therapy? What can a physical therapist do to help? What can I expect from my visit? At In Touch Physical Therapy our gym includes all the equipment for your rehabilitation and exercise needs. Whether you need to get back to work or back to the golf course, In Touch is the place to come. In fact, in some cases, we’ve helped patients get back to work as soon as a month earlier than their doctor expected. We’ve also been able to keep athletes in the game. We provide physical therapy for all ages and fitness levels so whether you need to get back to work, or get back to playing with your grandkids, call In Touch Physical Therapy, we are your path to better health! We assist you in recovering quickly so you can get back to resuming your normal activities. Keep in mind that you don’t pay us a dime unless we consider you to be a candidate for physical therapy. When we do, we will assist you to obtain reimbursement from your insurance provider and work with your doctor. You will get a professional caring physical therapist coaching you to be sure you’re giving 100% and doing the exercise properly and effectively. You Have Nothing To Lose, Except Pain and Discomfort!